One of the outings my little guys look most forward to is having lunch at Daddy's school. They feel so grown up eating their peanut butter and jelly sandwiches at the junior high lab tables, with their little legs swinging from big people chairs. And after our bellies are full, it's time for the really fun stuff: looking through magnifying glasses, drawing on the whiteboard, completing "assignments" on pieces of binder paper and playing with Daddy's collection of stick bugs. One of our favorite parts of these lunch dates is making the rounds to see Daddy's co-workers. And the very last stop is always to the front office to see Miss Anita, the school secretary. Junior High can be an intimidating place when you are only two feet tall, but Miss Anita always bends down to talk to Henry and Wilson face to face. She happily sets aside the ringing phones and lines of students to truly spend time with us. When everyone else is asking Daddy if he got so-and-so's email or if he will be at the conference after school, Miss Anita makes a point to ask my boys what is going on in their lives. She is genuinely eager to hear about train rides, preschool and playdates. 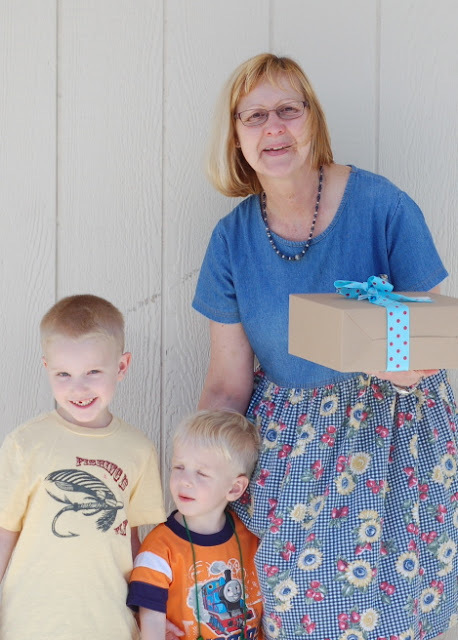 This June, Miss Anita will be retiring after 18 years in her position. She has always taken care of Will, whether running interference for difficult parents or tracking down extra white board markers at a moment's notice. But the boys and I will most miss her smiling face and nurturing hugs. A couple months back, Miss Anita mentioned that she especially liked cherry pie. 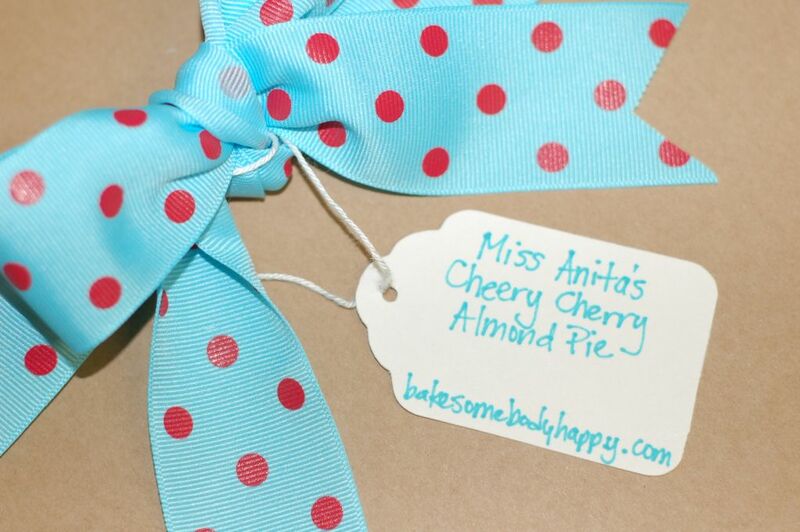 So, for all of the times she has brightened our day, I present Miss Anita's Cheery Cherry Almond Pie. Pulling up to the four-way stop on my way home from dropping off my oldest son at preschool, I noticed the familiar stenciled sign reading "Sweet Cherries." 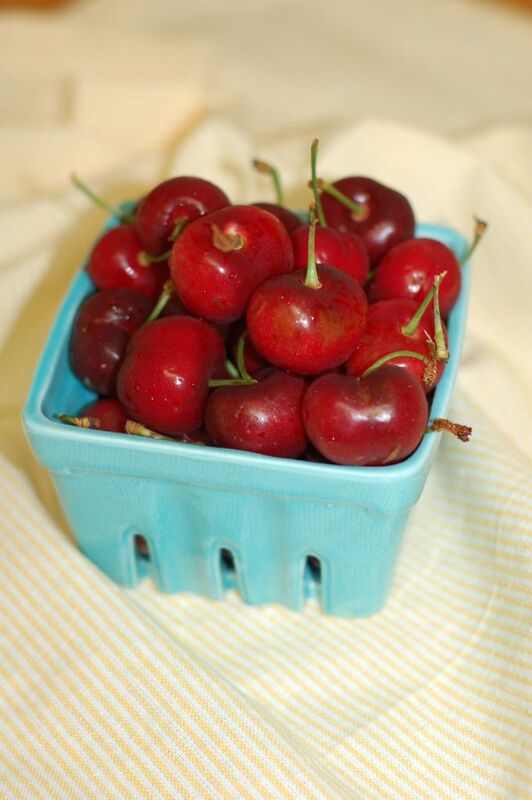 The first cherries of the season! So, I promptly pulled off into the gravel lot and purchased a huge bag of red, ripe cherries from the man working the makeshift fruit stand. 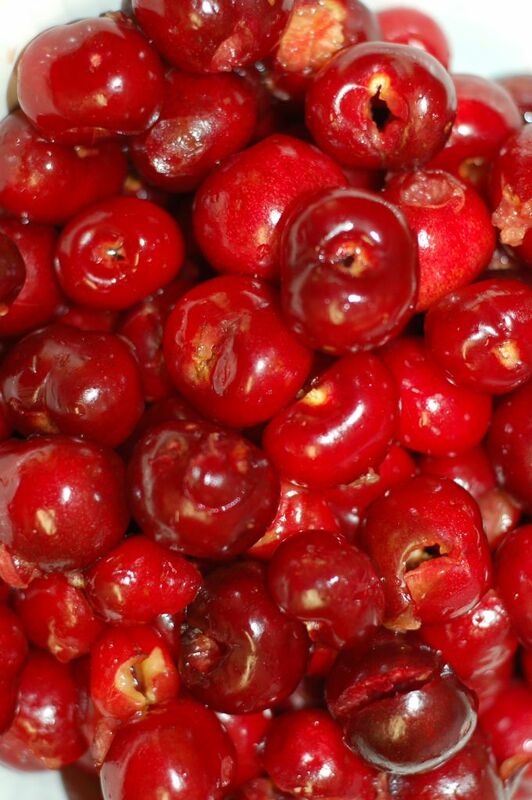 But, having never made a cherry pie before, I was slightly intimidated by the idea of pitting each cherry by hand. I decided it might be a worthwhile investment to purchase a handheld cherry pitter - and to my chagrin, they just happened to be on serious clearance. Don't you love it when a plan comes together? As per usual, I had two eager "helpers." 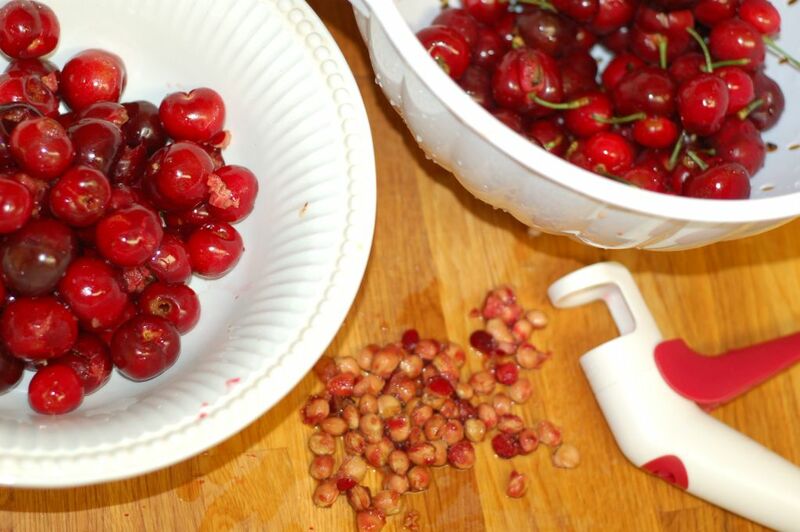 Wilson was fascinated by the trigger action of the pitter, but settled for prepping the cherries by pulling off the stems (and taste-testing a few along the way). Now, let's just hope that all those little "helping" hands don't mean a pit or two snuck in. I had prepared the dough the night before, using my usual recipe with the addition of vanilla and almond extracts. 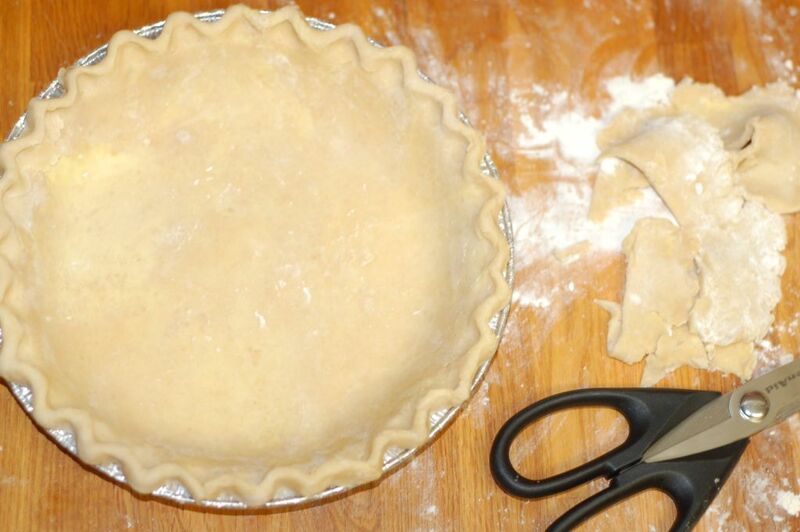 So, I unwrapped the chilled dough, rolled out the crust, nestled it into the tin and trimmed and crimped the edges. Ten pies into the Bake Somebody Happy adventure, Will said this was my most "symmetrical" pie yet. Yay for progress! 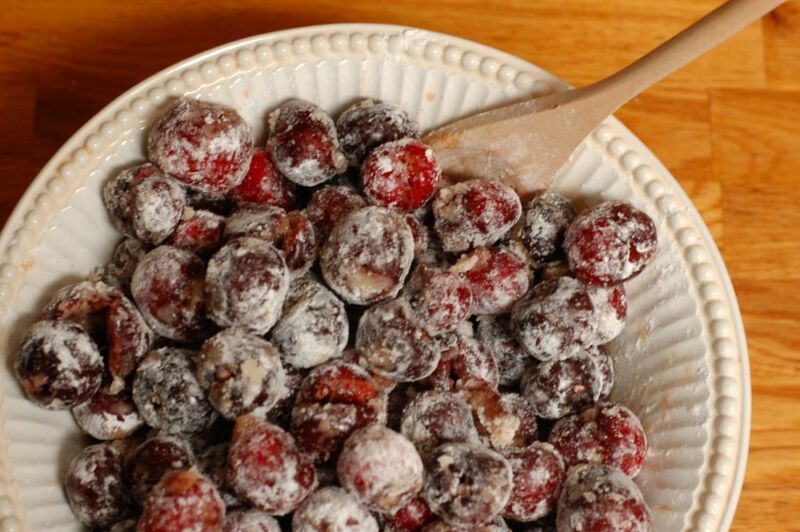 I added sugar, cornstarch and salt to the heaping bowlful of pitted cherries and set them aside. 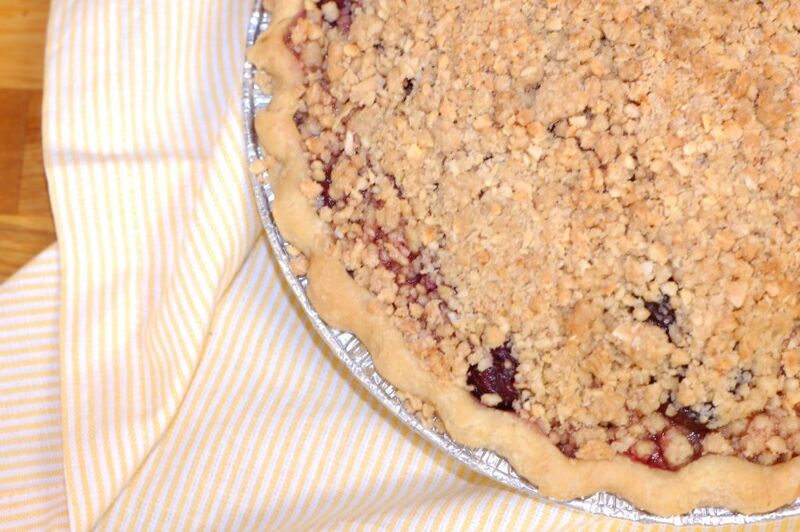 Then, I prepared the crumble topping, which is what really sets this cherry pie apart from most others. 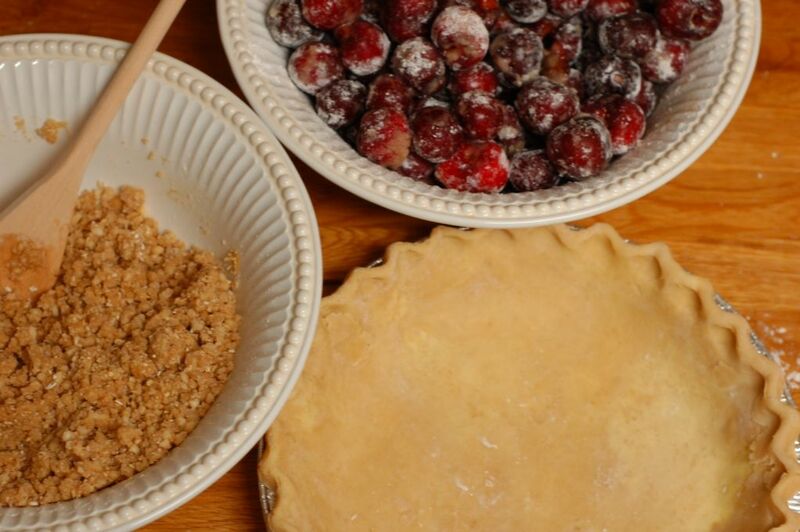 Instead of the traditional lattice crust, I opted for a streusel that highlighted the addition of almond. 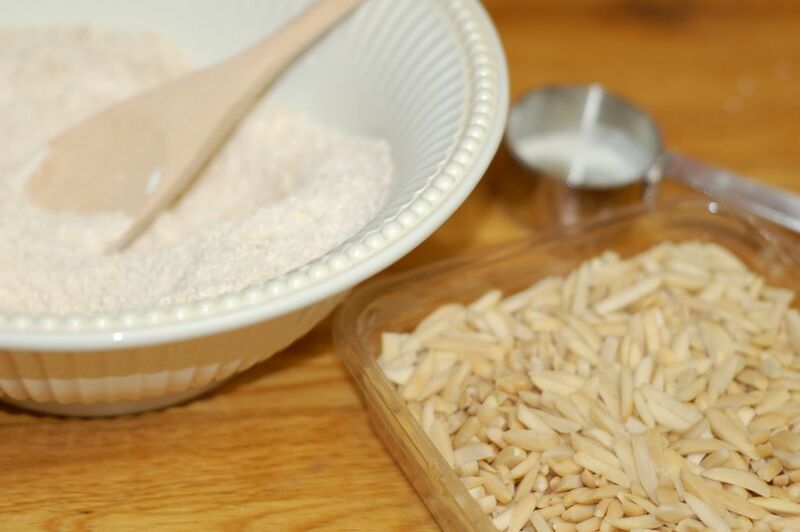 I coarsely ground slivered, blanched almonds and stirred them into a mixture of oat flour, all-purpose flour, sugar, cinnamon and salt. Then, I worked in the melted butter, using the tines of a fork, until it came together in large crumbs. I layered the crumble over the cherries and put the pie into the oven until the juices bubbled and the whole house smelled like summer. When I asked my boys what their favorite thing about Miss Anita was, Wilson said, "She always hugs me," to which Henry added, "Yeah, she hugs me." Miss Anita has become an adopted grandmother to all of us and we will so miss her warmth and kindness. Happy retirement, Miss Anita!